It’s that time again…LKN YMCA Sprint Triathlon. I like this event because of how local it is…nothing like sleeping in your own bed. I arrived at transition and setup. Then got my chip and was marked, then it was off for a quick warmup run. Afterward, down to the water for another quick warmup. So now it was time to wait for the start, which I was in the 3rd wave. That would be a factor later. It came my time and we were off at the gun. I went out a bit quick to get clear of my group and then settled in. This strategy worked great for my group but I was quickly into groups of people from earlier waves. It was a bit challenging but I did fairly well getting through them. I came out of the water in 4th…not bad. I ran into transition, quickly changed and came out in 1st thanks to some earlier flying mount practice. The bike went well, I took a little longer to settle in knowing this course was back end loaded. I got passed for the lead at mile 5…at which time I made a decision to let him go thinking I would see him on the hills. Once again I was still passing tons of people during the bike. Coming to the end of the bike, I still didn’t see 1st place. A quick transition, well kind of, I did miss my rack which cost a few seconds. Now it was onto the run…I decided to switch my plan a bit and not settle in as much at the beginning of the run so I could try to catch 1st. I caught and passed many people, got the best run split but didn’t catch 1st. 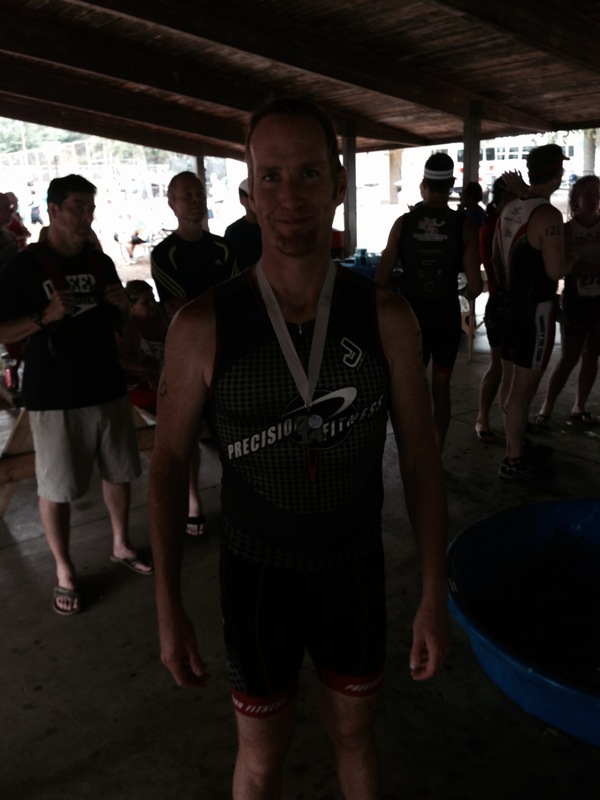 I ended up 2nd AG and 16th Overall. Much better than the beginning of the season with consistent improvement throughout the year. Might have something to do with a little more sleep these days…ha.